Although it may be the last thing you want to do when youre suffering from pain, exercising with arthritis has proven to be very beneficial. It seems only logical to stop moving the part of your body that is aching, but following that instinct may be more negative than positive. Arthritis, also called osteoarthritis, is a disease which attacks the joints and causes the cartilage on bones to wear out. Popularly thought of as exclusive to senior citizens, arthritis can affect people of any age group. Generally, people above age 45 are at a higher risk of developing arthritis, but there are other lifestyle factors that can contribute as well. For example, gout, a type of arthritis, is caused almost exclusively by diet. For other forms of arthritis, being overweight quadruples the risk of developing the disease due to the increased wear and tear youre placing on your joints. In addition, women often experience arthritis at a younger age than men. Arthritis can manifest in any part of the body, but is most common in the back, neck, knees, fingers, and hands. Inflammation control is key to preventing continued pain, and while it is true people should avoid activities that upset their afflicted joints, moderate exercise has been proven to reduce pain and swelling. Exercise should always be a gradual process and you should consult with your doctor to make a specific plan that fits your needs. An exercise plan should aim to increase the damaged joints range of motion, strengthen the surrounding muscles, build overall endurance, and improve your balance. 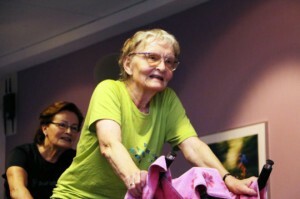 Since arthritis usually presents itself in older people, strength training is crucial. The last thing you want to happen, on top of arthritis, is a fall to occur due to reduced strength in your body. Building muscles in your thighs can help stabilize your legs and actually reduce discomfort in damaged knee joints. Building upper leg muscles increases function of the leg and places less stress on the already pained knee joints. Beyond strength training, aerobic exercise helps as well. Aerobic exercise not only encourages weight loss, but also promotes muscle stability, oxygen intake, and balance. Since running is usually not a good option due to existing pain - swimming, using a stationary bicycle, or other non-impact workout machine can be good choices. Dont be discouraged by thinking aerobic exercise means an overly intense workout. It could mean moderate activity for five minutes; you dont have to go crazy with it. The important thing is to get started because your endurance will increase the more often you work out. If jumping into aerobic exercise sounds daunting, why not try stretching and flexibility exercises? Since joints impaired by arthritis dont move with the same ease they used to, stretching can improve the joints range of motion. Light yoga, tai chi, or even stretching on your own are all beneficial activities. If stretching sounds too hard right now, try walking to jump-start your exercise program. Walking is extremely important and tends to be overlooked as a form of exercise. Alarmingly, a nation-wide survey conducted by the CDC found that 53 percent of people with arthritis do not walk at all and 66 percent walked for no more than 90 minutes per week. The recommendation for walking is 150 minutes/week and only 23 percent of those surveyed met that number. This is not only detrimental for the joints affected, but can cause weight gain, increased risk for heart disease, high blood pressure, and a slew of other problems. Stopping movement completely as a result of pain is not a smart idea. The less you move, the weaker your body gets and the harder it becomes to exercise later. Remember, whatever you do, start slowly and build up your strength and endurance. Within no time, youll notice a marked difference in the way your joints and overall body feel. Max Gottlieb is the content manager of Senior Planning in Phoenix, Arizona. Senior Planning gives free assistance to seniors and theirfamilies, helping them decide which benefits theyre eligible for and which type of senior care is most appropriate for them.